Tricia Vita - Art Awhirl! No part of this website may be used or reproduced in any manner without written permission. At first glance, this cedar barn in the hamlet of East Islip on Long Island might be mistaken for the winter quarters of an old-fashioned carnival company. A royal- blue trailer emblazoned with the words “THE MIGHTY, THE MAJESTIC, THE MAGNIFICENT MILITARY BAND ORGAN OF THE EMPIRE STATE” sits parked in one corner---a life-size, papier-mâché clown standing on its hitch. And scattered to and fro are dozens of fancifully carved animals, scenery panels and other pieces of a slowly coalescing 14-year-old vision. A former social studies teacher who turned professional woodcarver two decades ago, Holzman got hooked on carousels when he was restoring his first horse. Pretty soon, he set out to build his own carousel---one that would me more than just a merry-go-round. The result is the Empire State Carousel, a ride with carvings and painted panels celebrating the history, folklore and natural environment of New York; it's a sort of cultural heritage lesson in motion. He began the project in 1984, founding a non-profit organization with fellow carvers Jim Beatty and Bruno Speiser. Since then, they have enlisted the help of more than 1,000 volunteer carvers, painters and craftspeople from Long Island all the way to Niagara Falls. A decade and a half later, the carousel is nearing completion. For his own part, Holzman has a youthful enthusiasm which belies his white beard and his 64 years. It’s easy to believe that he is the embodiment of a bit of folk wisdom he likes to share with visitors: “Every time you ride a carousel you add a day to your life.” When he turns on the carousel's band organ, multicolored lights flash on the stage-like facade, and Jim Beatty’s carving of John Philip Sousa “conducts” a rousing rendition of "Shuffle Off to Buffalo" as a woodpecker taps on a log in syncopation. With 28 whimsical riding animals crafted by 12 individual carvers, it will be hard to choose which one to ride on the carousel’s opening day, which could come as early as the end of this year. “This has taken so long because it is so elaborate," Holzman says. "It is the revival of a folk art tradition, We take 250 to 300 hours to make each one of our animals because all of them are absolutely unique.” Among the finished pieces Holzman shows off are Bruno Speiser’s Benny, a brook trout (the official state fish of New York) decked out in scallop shells and jewels; Ellery “Barney” Barnaby’s Monty, a five-foot-long Adirondack moose with an antler spread of three feet; and his own Daphne, a duck with a basketful of Long Island delicacies tucked under her saddle and the Montauk Lighthouse standing proud on her ornately decorated side. “A typical carousel animal from a factory took 60 to 70 hours to turn out," says Holzman, who has taught carving classes at the Herschell Carrousel Factory Museum in North Tonawanda, a western New York town that was America’s premier producer of carousels in the first decades of this century. “They’d get the legs from one part of the factory, the body from another, and the head from another. Then a different group assembled the pieces. We have essentially gone back to the old English cottage industry, where each craftsperson would create the whole piece in his own workshop." The barn where the Empire State Carousel is being assembled (the building is rented for $1 a year from Islip’s Parks and Recreation Department) is not only filled with the animals but is a storehouse of other delights as well: A carved panel pays homage to the original Uncle Sam, meat-packer Samuel Wilson; a Works Progress Administration-style mural depicts the arrival of immigrants at Ellis Island; wooden plaques trumpet spirited quotations and evocative place-names; and more than 100 diminutive carvings of New York’s architectural wonders wait for the day when they will form a miniature skyline atop the carousel’s rounding board. In addition to carving half of the pieces, Holzman is the carousel’s chief administrator and fund-raiser. He and his team have barnstormed the state, seeking out carving clubs, quilters guilds, and local chapters of the Society of Decorative Painters. “The problem has been just trying to raise funds,” he says. “We’ve raised half a million dollars so far.” With contributions ranging from more than $10,000 in pennies collected by schoolchildren to $185,000 from the state legislature, the carousel is 95 percent finished, though additional funds are needed for construction of a pavilion. On the carving bench inside the studio, one of the last riding animals, a Labrador retriever with a bandana jauntily knotted around her neck, is taking shape from a block of basswood. "She's modeled after my dog, Merry-Go-Round," explains Holzman as he runs his hand affectionately over the wavy lines of her coat. "We got her just about the time the carousel was started. I wasn’t quite sure what kind of flow I wanted until I---and these are Gino’s words---cut my way down to it.” The late Gino Masero was a British master carver under whom Holzman studied in the ‘70s, and the man Holzman credits with teaching him to love a curved line. “The hair on the dog is a tribute to him, as I try to move it and shape it and make it have life,” he adds. Among the 30 or so tools Holzman is using to bring Merry Dog to life are gouges and chisels that Masero selected for him at a shop in London, as well as intricate tools acquired from the estate of a North Tonawanda carver of band-organ fronts. “Every few months, I take one or two and introduce them into my set, because you can’t pick out 150 tools that you don’t know. I have to get familiar with each one and find out its capability,” he says. Holzman's work on Merry Dog began with a sketch, which he then enlarged using a projector to a size 30 to 40 percent larger than life. Charley Muller, a crackerjack cabinetmaker, used the enlargement to construct a blank of 40 to 50 pieces of basswood, joined with yellow carpenter’s glue and dowels. Following time-honored tradition, the belly of the animal is hollow, and a note from the carver is tucked inside. Since the project began in the ‘80s, lots of antique carousels have been broken up and their parts sent to the auction block. Collectors have bid as high as $121,000 for a single Coney Island-style horse and $174,900 for a Saint Bernard figure. 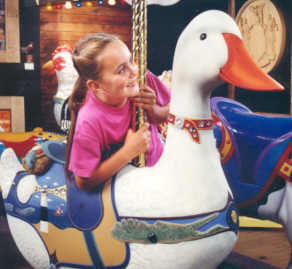 The soaring prices for vintage pieces, however, have helped spur interest in contemporary carousel carvings. Holzman, who is taking on private commissions now that work on his magnum opus is winding down, estimates that the riding animals on the Empire State Carousel are worth $10,000 to $15,000. What's more, the dwindling number of antique rides---only about 175 remain in operation in North America---has inspired the creation of a handful of brand-new, old-fashioned carousels. In 1991, the first hand-carved wooden carousel to be completed since the ‘30s was built as the $1.25-million centerpiece of a downtown revitalization project in Mansfield, Ohio. Taking a cue from these efforts, the Long Island community of Bay Shore (adjacent to Islip) is actively courting the Empire State Carousel. If promises of a piece of land and a building result in a merry-go-round marriage, Holzman’s dream machine could be assembled and awhirl by the end of 1998.